For years, the technicians in the ProShop have given NAPBIRT clinics, clinics to repair students, college students as well as clinics at MusicMedic.com for techs and players all over the world. The ProShop’s innovative approach to repair has brought saxophone repair to a new level, with specialists in every aspect of saxophone repair and overhaul. With our revolutionary approach to overhauling saxophones, the Sax ProShop is able to consistently produce extremely high quality saxophone overhaul: which we call Uberhauls. 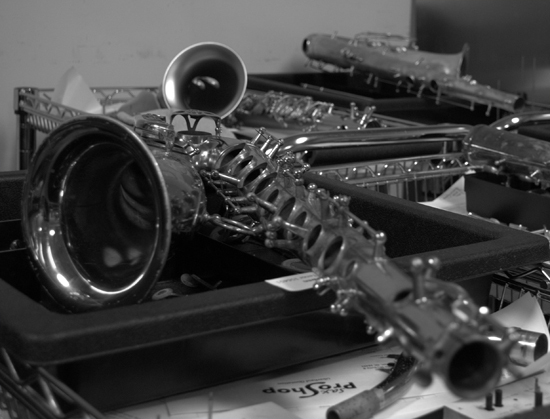 Our technicians are truly specialists, not only in the field of saxophone repair but in their specific discipline. The Sax ProShop technicians are happy to invite you to come to the shop, sit at our benches, and learn each aspect of the repair from technicians that do that job every day. Although the courses are available to anyone, they will be the most useful to a technician who has done extensive work on saxophones or has experience in the band instrument repair trade for 5+ years. The MusicMedic Sax ProShop is taking a week off our normal schedule of Uberhauls, modifications, manufacturing necks, and merriment to help you begin or build upon your journey into saxophone repair. Join us for this action-packed, hands-on week of learning, improving, and doing. Over the years, many folks have come to us and to study and improve their skills. Now, we are offering a 5-day open course where we can all learn together. You’ll work side by side with the instructors and other participants in this repair immersion class. Focus only improving your skills or, for the very beginner, learn this wonderful trade in a way you’ll never forget. This course is ideal for beginners, hobbyists, and repair students, and participants are not required to have any prior repair experience. Intro to Tools, Anatomy of a Saxophone, Selecting and Applying Materials, Selecting and Replacing Pads, Replacing and Tensioning Springs, Key-fitting basics, Set-up basics, Cleaning, Assessing Saxophones for Repair, and Troubleshooting. 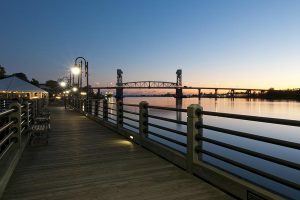 Work hard during the day with the Sax ProShop technicians, and enjoy beautiful downtown Wilmington, NC in the evenings. Participants should bring something to take notes (computer or notebook), something to take photos (phone or camera), a good attitude, and willingness to learn! Participants are also welcome to bring an alto or tenor saxophone of their choice with them. All participants are eligible to purchase tools, repair kits, and instrument repair supplies at a reduced cost. We are able to offer housing at a greatly reduced rate should you need it. The cost is $50.00 per night per bed. You will stay with other participants in one of two downtown historic homes. In some cases, it may be necessary to share a room but not a bed. You need only what you would bring to a hotel, as amenities such as coffee, towels, soaps, linens, etc. are all provided. The homes are side by side and located within walking distance to downtown food and shops. The house has a modestly stocked kitchen for you to use. Transportation to and from the airport is approximately $9.00 by Uber and $15 by Taxi. Transportation to and from the Sax ProShop will be available daily at no charge. It is very possible to attend this week and not rent or bring a car if you are comfortable walking 6 blocks to downtown. Register early by phone or email. Spend 3 days with Ryan Walker learning about the incredible art of engraving. Participants will learn and practice several hand engraving techniques on a predetermined design. This course will include an overview of engraving techniques, a history of engraving and engravers, graver types, tool making/modifying, graver sharpening, workpiece holding, patterns, and pattern transfers. Participants will leave this immersive clinic with the basic knowledge and understanding of the art of hand engraving. No experience necessary, but this course would be best suited for those with an eye for detail and skill at drawing. Note that the nature of engraving involves handling very sharp tools, so there is some mild inherent risk associated. All supplies engraving supplies are provided. The materials fee (to be determined) includes a Sharpening Stone, various gravers, and handles, as well as engraving surfaces. Participants should bring something to take notes (computer or notebook), something to take photos (phone or camera), and a good attitude, and willingness to learn! Work closely with the techs in the ProShop for an overview of all techniques and methods involved out Uberhaul. Sit and work with our professional technicians at their benches learning our proven approach to each aspect of the Uberhaul. This course has a focus on the mechanical repair aspects, and is a very concentrated 5 day workshop. This is the ideal course for anyone looking for insight into our assembly line style repair shop or those looking to greatly improve their saxophone work. -We will ask you to tell us about your repair experience or have you send a resume if you have one. This will help us design your course. Learn to Uberhaul your horn with the crew of the Sax ProShop. Work closely with the specialists in our shop, spending ten days going through each station from quoting, body work, to key fitting and tone holes, to finally dry fitting, padding and tuning. This course is intense, and will require participants to work in a fast-paced environment, but will allow most techs to leave with a horn that they have personally Uberhauled under the direct supervision of the sax ProShop specialists. Each course will be customized for the repair tech and based around the horn your horn. Prices below are for alto and tenor other instrument may take longer and cost more. 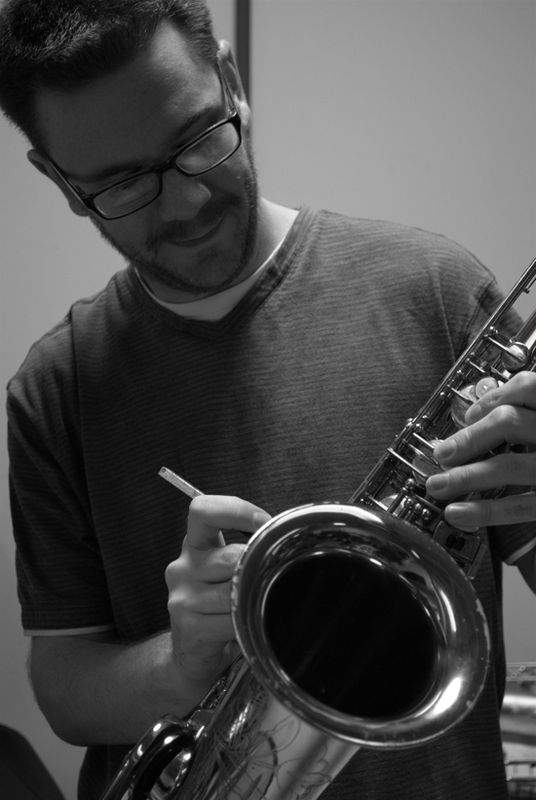 Here at the Sax ProShop we know that repairing a saxophone is difficult and requires a large variety of skills. To make sure that all of our customers get the very best service, we run our repair shop assembly line style. That means that each technician is a highly trained professional and a master at their particular aspect of saxophone repair. Whether you are a player, technician, or manufacturer, we now offer you the opportunity to schedule a one-on-one lesson with any of the technicians from the ProShop via Skype. With Skype lessons, you have the opportunity to learn exactly the skills you need from specialists that do the job every day. No matter how vague or specific, rudimentary or advanced your questions are, one of the Technicians at the Sax ProShop can teach you the concepts and then demonstrate the techniques that you need to know to do the repair correctly yourself. Whether you want to acquire a general skill or have a specific issue with a horn you are working on, we can develop a lesson plan for you! To learn more about each station, watch the video here or take a walk through the Sax ProShop. There is a 1-hour minimum for all lessons. You can contact us at SaxProShop@MusicMedic.com for more details or to schedule a lesson. The Sax ProShop is located on the east coast of North Carolina, in beautiful Wilmington. Wilmington sits on the Cape Fear River, and is minutes from multiple beautiful beaches. We encourage you to come study, bring your family and take a vacation. Fresh ground coffee is always provided at the ProShop. For an additional cost, our staff will help you with travel to and from the airport, transport daily to the shop, and will book your hotel accommodations. Click here to see photos from past participants!